Global tech giant Apple on Wednesday launched the Apple Watch Series 4 line of smartwatches that grabbed a lot of eyeballs. The all-new revamped version of the Apple smartwatches was much-awaited as the Watch design didn't go through major makeovers since its debut more than three years ago. The wait is finally over as Apple unveiled iPhone Xs, Xr, Xs Max + and Apple Watch Series 4. Besides the several flagships, the global tech giant launched the Apple Watch Series 4 line of smartwatches that grabbed a lot of eyeballs. 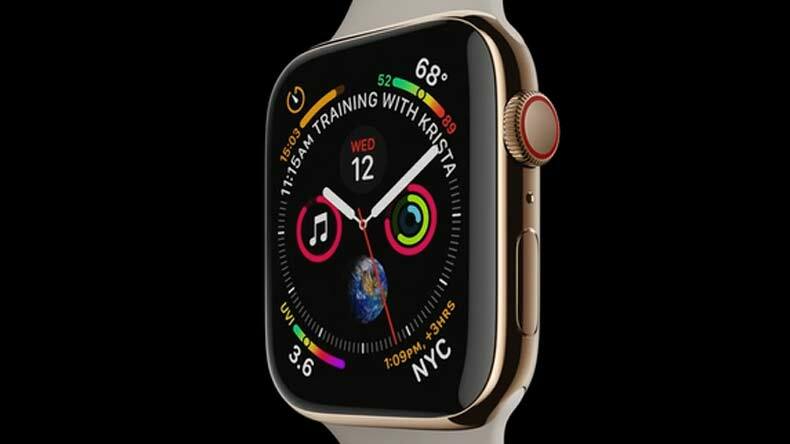 The all-new revamped version of the Apple smartwatches was much-awaited as the Watch design didn’t go through major makeovers since its debut more than three years ago. If we have to note down the new Apple Watch Series 4 then we would say that it has become larger and better. The new Apple watch has an edge-to-edge display, credit goes to the bigger display with rounded edges. The display is 30% larger than the earlier one and the Watch has got two new sizes, 40mm and 44mm. Also, the Watch is comparatively thinner from what we have seen in 2014. Interestingly, the makers have focused on making the Watch more of a medical device. It has been improved and given an entirely new identity. The Watch comes with a new health sensor that will alarm you if it detects the presence of atrial fibrillation and lets you take an ECG or as we term it electrocardiogram. The device has also received a clearance from the US Food and Drug Administration to be used as a medical device. The Apple Watch will be available to order from Friday and starts at $399. Apple has also dropped the Watch Series 3 price to $279. Also, the GPS=LTE version is available at $499. Above all this, the Apple Watch Series the new dual-core 64-bit S4 processor is custom designed and the makers claim two times better performance than the previous model. The LTE red dot indicator is now a ring and the speaker has also been improved. The rear of the watch is now black ceramic with sapphire crystal. The Watch has a battery life of 18 hours per day.